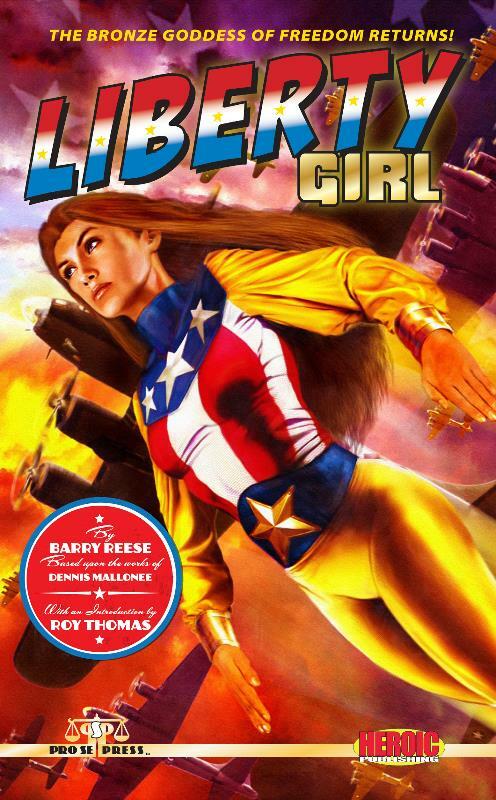 Without a doubt, there are a lot of things to like about the comely, flag-waving superheroine named Liberty Girl. And all of these good things are present in her prose fiction debut. Many readers will enjoy her “woman-out-of-time” conundrum. Others will salute her patriotic zeal. And others will certainly be attracted to her “bronze beauty” good looks. For even more insights into Liberty Girl’s ongoing popularity, check out the book’s introduction by Rascally Roy Thomas. He’s obviously a big fan. 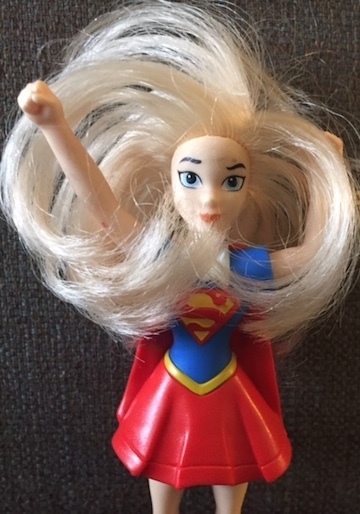 Elena Hunter’s superhero career began during WWII when she was exposed to a strange form of radioactive gold that put her “in tune with the fundamental forces of the universe.” Like Captain America, Captain Flag, and Major Victory, she quickly became a beacon of hope and pride for her country during the war years. But the star-spangled heroine mysteriously disappeared sometime during the ’50s and no one knew what happened to her. The Avengers couldn’t even find her in a block of ice. Eventually she returned to action eight years ago looking as young and fit as she did during her heyday. This mysterious fiftysomething gap provides Liberty Girl with a weird and unexpected backstory for readers to piece together. Based on a comic book series penned by Dennis Mallonee, this Liberty Girl novelette (which also contains a throwaway short story called “The Devil’s Daughter”) is an earnest attempt to bring back storytelling hooks from the golden age of superhero comics. Does it succeed? Yes, we suppose it does. But it does so in a rudimentary and banal manner. Why so dull? A little more flare would have been nice. A pocketful of posies and a box of Tcho chocolates would have been nice too. Liberty Girl is a relatively new creation (she debuted back in 2006), but she embodies the characteristics and spirit of a bygone era. More than anything else, she is a woman stuck between two worlds. To his credit, the author understands this dichotomy. It’s too bad he wasn’t able to transcend the character’s comic book roots and bring her to life more vividly in prose. Ultimately, Liberty Girl (the novel) is a fans-only endeavor. This entry was posted in Published in 2013 and tagged Barry Reese, Liberty Girl, Roy Thomas. Bookmark the permalink.